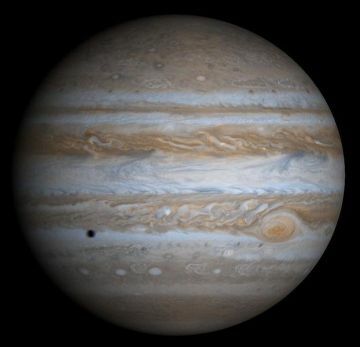 Photo courtesy of Jupiter photo by NASA/JPL/University of Arizona. Pluto reaches somewhere between magnitude 13.8 and 14.1 at opposition making it a rather challenging object to see from washed-out skies. But Pluto’s tiny size helps us pull it out of the light pollution: because it is star-like, we can use high magnification to improve the contrast. Even from my light polluted front yard, I’ve seen stars of this magnitude with my 10 inch Dob using moderate to high magnification (150x to 250x). So in theory, Pluto is within reach.